In need of some woodwork? 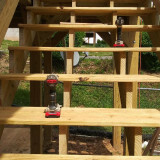 Chances are you’ll want to hire a Weaverville, NC carpenter. Carpenters work with all types of wood and can specialize in many different areas, including framing, finishing and custom-made furniture. Make sure you choose the right Weaverville carpenter for your job by asking plenty of questions, viewing their past work and reading reviews. 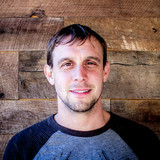 Levi is a skilled and trusted carpenter in the high country. He will work with you to improve your space! 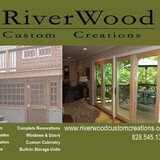 Windows, doors, framing, trim, decks, sheds, tile, floors, etc. Repairs too! From your table drawings, to complete, finished design, we work with you to create the ultimate dream come true. Natural Edge Table Company specializes in creating modern furniture from live edge wood. We build natural edge wood tables, headboards, dining tables and more. We can create custom pieces, too! Check out our online store. Greenkind Builders is a NON-SMOKING crew of skilled craftsmen offering green building and remodeling services. We specialize in utilizing reclaimed or salvaged materials, reducing construction waste and providing CREATIVE solutions. We bring vision and inspiration to every jobsite. If you can dream it, we can build it! Greenkind Builders was established around basic core values of kindness, integrity and honesty. We value our clients and strive to ensure total satisfaction. Jeff Johnson Timber Frames, Inc. is a small, owner-operated timber frame company in the southwestern mountains of North Carolina. We operate with a staff of experienced timber framers who enjoy their craft and love the woods they work with. All are members of the Timber Framers Guild and take pride in the tradition of the timber framing craft. “In our efforts to achieve fine craftsmanship, we have been able to create functional art.” – Jeff Johnson We make the extra effort to be sure your timber frame is constructed with the highest quality joinery. Our joints are fully housed including knee braces. Housed joinery increases the strength and stability of any timber frame structure. We also offer various options in wood species for timber frame homes, entry ways, carports and pavilions. For photos and details on our joinery and wood species options for timber frames, please visit our Timber Frame Construction page. We provide several standard timber frame designs which will suit a great variety of floor plans. If our standard timber frame designs do not work with your home plan, we are able to design a custom timber frame home for you. To view these designs and more details, please visit our Timber Frame Homes page. We also have several home plans that we can convert either completely or in part to timber frames. When a home is only partially timber framed, we call this a hybrid timber frame home. You may view these plans on our Home Plans page. ShowerCrown designs, builds and sells Custom Shower Valances/Cornices for DIYers. Installation takes 15 to 20 minutes, and utilizes simple tools that every home owner has. A commissioned carpentry and install company with a focus on combining modern craftsmanship with unparalleled customer service. Francisco Garcia who is the owner of Garcia Construction Services provides every service needed to make your home look amazing. Garcia Construction can help guide you through the process to make your thoughts and ideas come to life! From framing, to new construction, this company can do it all.